I just painted this old patio side table and weather beaten fruit bowl I found while cleaning out the garage and I'm so pleased with the results. Even after being left out in the rain for a whole week it still looks great! No peeling or chipping. Well, yet anyhow! So here are some before and after pics and paint details.. The patio side table. A little beaten up but sturdy. I lightly sanded it (and I mean 'lightly'). It took me all of 3 or 4 minutes. And here's the fruit bowl. Weather beaten and cracked from being left outside all winter long. I was going to throw it away but I'd been looking for something to try out my new outdoor paint on. Perfect! And here they are. All painted and prettied up. I gave them both two coats of paint and let the paint dry for an hour in between each coat. From this photo below you can see that there's a lovely 'sheen' effect to the table as this paint is also wax enriched. Nice..
And here's the paint I used. Ronseal Wax Enriched.. Which means a built in sealant so NO EXTRA STEPS!! You're done in one.. Thanks so much for that amazing demonstration. I'm off to buy that Fern Ron seal paint tomorrow. Love your blog Marie. So honest and detailed sharing of product, technique and finished project. You have definitely given me confidence to try this on an old bench I've had for many years that's needing some love. 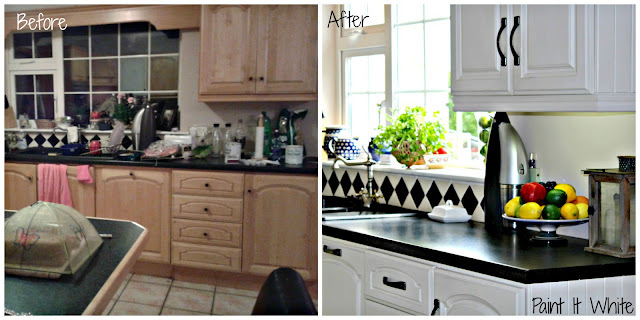 Kitchen DIY - Brighten Up Your Kitchen with Annie Sloan Chalk Paint! How To Stencil Kitchen Floor Tile & How It Held Up One Year Later. Pink & Gold Stenciled Chest Of Drawers Makeover..
Clare Haven Services Before & After Painted Furniture Project. Easy DIY From Plastic Scales to Vintage 'Antiqued Metal' Look..
Photoshoot For Seoidin Irish Handmade Jewellery..
Up-cycled Napoleonic Blue Painted Kitchen Bar Stools..